Park it with these sturdy glasses handmade in Colombia of recycled glass from car windshields and windows. Handmade in Colombia from recycled glass, these substantial stemless wine glasses will add an interesting twist to any glass of wine. Sturdy and strong, the thick glass has a slight green hue that comes from a tint originally added to lessen the sun's glare. 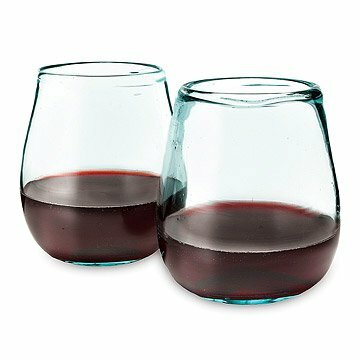 Beautiful and interesting, these stemless wine glasses are an uncommon take on a stylish design. Various pieces of plain and printed bottles are salvaged to make these glasses. Evidence of the bottles'original logos and lettering may appear in the form of black and white flecks. These subtle spots cannot be prevented. Also due to the hand-crafted process, there may be a slight variation in sizing and the texture of each item will differ. Air bubbles and small "imperfections" add individual charm to each one-of-a-kind piece! Sold as a set of 2. Featured on CNN Money and the Today Show. We love that they are recycled windshield glass. Reduce, reuse, recycle! The cups are both unique because of the recycled glass materials. My cups have a smaller mouth opening than the one pictured. I found these glasses for a Secret Santa exchange and almost kept them for myself! I use these glassss for everyday use. Great for clumsy guests, and gorgeous to boot. I will be buying more of these glasses!! I drink wine from these. Although I suppose you could put in something else like water.... But where's the fun in that?